Sunday June 6th 1897 We went to church up tow this morning and over home for dinner. I was down at Otts a little while to see the house since it had been papered. We came home in time to do the evening work Monday June 7th 1897 Will washed for me this morning and then we took a ride down to the river. I have never been down across the farm. In the afternoon I worked setting hens and taking care of little chickens and helped Will put out tomatoes. Tuesday June 8th 1897 I ironed and baked bread and Will churned for me after dinner. I was over to see Auntie in the afternoon. She is not so well as Saturday. weather cool. Wednesday June 9th 1897 I did some baking this morning and Will helped me make hominy. I worked with the chickens some after dinner and went over to see how Auntie was. weather warmed. 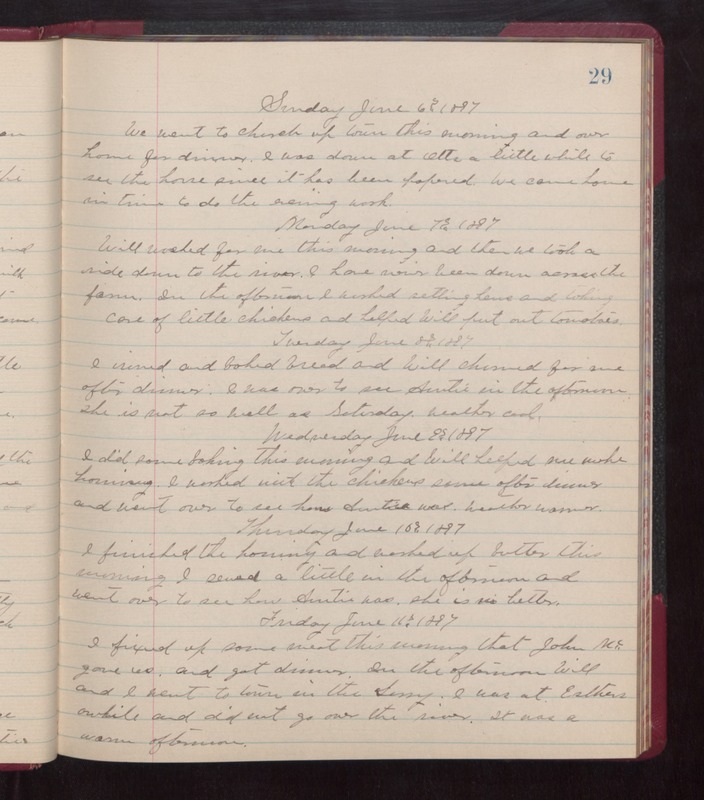 Thursday June 10th 1897 I finished the hominy and worked up butter this morning. I sewed a little in the afternoon and went over to see how Auntie was. she is no better. Friday June 11th 1897 I fixed up some mean this morning that John Mc-- gave us and got dinner. In the afternoon Will and I went to town in the Surry. I was at Esthers awhile and did not go over the river. It was a warm afternoon.